Imagine a future where plastic is sustainable, green, biodegradable and manufactured without chemistry. A team of researchers is hoping to achieve exactly this by means of a ‘green soup’ of microalgae. Natural rubber was used for centuries by indigenous populations around the world, but it was not until the industrial revolution in the 19th century that plastic as we know it today was introduced by Alexander Parkes in 1862. Ever since, and particularly after World War II, plastic has spread to engulf every aspect of our lives. Particularly as of late, this has also spread to our oceans, where heaps of photodegraded plastic form gigantic ‘garbage patches’ – diffuse soups of floating plastic that is not biodegradable but enters the food chain via ingestion by aquatic organisms. Ever since concerns about adverse health effects from plastics and plasticisers – the latter of which, since their discovery in the wake of World War II, have been derived from petroleum-based chemicals – scientists have struggled to find a viable bio and ecosustainable substitute that is suitable for industrial use, i.e. cheap to produce in large quantities. Researchers at Aarhus University, in collaboration with colleagues at the Technical University of Denmark, the University of Cambridge and Kyoto University, have now come up with a possible solution – polymers produced from microalgae. "Most chemicals today are made from petroleum, but that won’t be around forever and it isn’t sustainable. We need technology that doesn’t harm the environment," says Associate Professor Zheng Guo. The idea is to extract oil from the algae and subject the fatty acids in the oil to the right enzymes. This way the researchers can transform the lipids into polymers. Polymers that are sustainable, manufactured using green biotechnology, without chemistry, and that are biodegradable and harmless to the environment. Polymers that, in principle, can be used to create any kind of plastic. "They basically resemble LEGO® blocks that originate from microalgae. The blocks can be assembled to create any design. These are harmless and only contain biological molecules. That’s what we hope to develop," says Associate Professor Peter Kristensen. The process requires protein engineering. To convert the lipids extracted from microalgae into polymers, the lipids need to be chemically modified. This can be done by enzymes, but the enzymes that exist are not optimal for the process. Instead, the researchers engineer the right enzymes for the job via natural mutational evolution. This is where Charles Darwin is unleashed. "We take an existing enzyme and optimise it via mutations. These are random processes that constantly occur in biological systems. Most have no beneficial effect and are ignored but, once in a while, a mutation can cause a positive effect. This effect is then implemented in the biological system. Thus the system evolves." Thanks to Kyoto University, the researchers already know which enzyme to begin with. Here project collaborators have isolated a specific enzyme that can catalyse the first step in producing plastic from microalgae. This enzyme can change the properties of lipids by attaching a hydroxyl group to the lipid molecular chain at a specific point. However, in order to create the wanted polymers, a second step needs to be taken, converting the hydroxyl group into a carboxylic acid. This second step will also be catalysed by an enzyme, which will be the next step the researchers will address. "Enzymes are proteins in the biological system. Each and every one is created from the information stored in the DNA of the system. You can say that the DNA is the recipe for the enzymes, so we change a bit of text here and there to create an entire library of different enzymes. Then we look at the entire pool of mutated enzymes and choose the best one for the task through selection," says Associate Professor Kristensen. Nature has evolved this way since the dawn of time. Because of mutations and natural selection, life is able to survive in the most incredible places on earth: at the bottom of the ocean where no light ever reaches, to the highest peak of the Himalayas, and the coldest tip of the Antarctic. "Nature sometimes goes beyond your imagination. 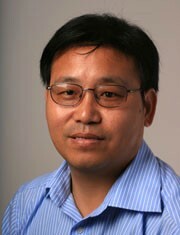 Enzymes can survive at unbelievable places and have the most amazing properties," says Associate Professor Zheng Guo.